Whether we want it or not, change happens. Some changes are by choice (marriage, moving to a new house, starting a new exercise program) and some are forced upon us (layoffs, empty nest, sickness.) We all have transitions in our lives where we don’t even know where to begin. 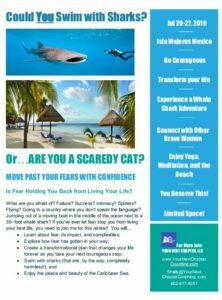 It is easy to get into a state of overwhelm and feel paralyzed. Your Next Chapter is a show that talks about various life transitions and how to move through them deliberately, mindfully, and with ease. Topics of discussion could include finding a new job—either because of being laid off/fired or can’t take another day of what you are doing. Your kids are leaving for college and you are facing an empty nest. Relationship transitions--you want to begin dating, are about to get married, or are facing divorce. Perhaps you are moving to a new house/city/state. Or you are trying to figure out how to live with a new medical diagnosis as a few examples. Whatever the transition, beliefs, expectations, patterns, roadblocks, and fear all play a role in how people make the move. This show provides strategies and tools to set yourself up for a successful transition. 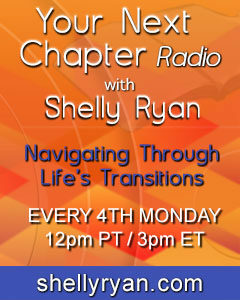 Join Shelly Ryan on the 4th Monday of every month at 12:00PT for Your Next Chapter Radio, Featured on the #1 positive talk network, streaming live on www.transformationtalkradio.com and www.thedrpatshow.com.